When temperatures drop, some people use this as an excuse to remain indoors. In fact, some will only leave their homes, when they are rushing to grab some groceries. On the other hand, there are others who see winter as the perfect opportunity to venture outdoors and enjoy a seemingly untouched and new landscape, which very few others are able, willing or ready to explore. Winter hiking also presents challenges that are rare during the warmer hiking months. However, the rewards are always greater. What Makes a Hiking Boot a Winter Hiking Boot? Every outdoor enthusiast understands the importance of a good hiking boot. In order to brave the challenges presented by the extreme winter conditions, you need appropriate winter hiking boots that will provide support, comfort and protection. A good pair of winter boots can create all the difference between a great hike and a regrettable hike. Buying winter boots might seem like a very simple thing to do. However, if you pay more attention to know more about the product or item that will be protecting your feet and keeping them warm and safe, you will spend less time worrying about your feet and more time enjoying a nice winter hike. Keep in mind that a winter boot isn’t necessarily a snow boot, which is an entirely different animal! Winter hiking boots are available in different types, varieties, sizes and designs. There are three main types of winter boots. These are Pac boots, insulated winter hiking boots and slip-on boots. The three types are discussed below. Slip-ons are those boot varieties, that don’t use a lacing system for securing the boot. Most of them come with pull tabs or large handles, or even loose cuffs in some. This design makes slipping them on and off easy and effortless. They can be made from many materials such as leather, neoprene, textile, rubber or sheepskin. Based on the application of the boot, it may or may not contain insulation. They also have varying levels of walking comfort and water resistance, in order to favor the convenience of not having to adjust laces every now and then. Remember the mukluk boots (aka: kamik) that were introduced by Inuit to handle the harsh Arctic conditions? Well, pacs are the modern version. A pac boot comes with a flexible and soft boot liner, fitted inside the waterproof boot. The liner can be removed from the boot in case you want to wash them. The liner is like a pair of socks, only that it has designed to match the interior dynamics and shape of the boot. Pac boots are among the warmest winter hiking boots, mainly due to the thick insulation inside. They are also waterproof to a certain extent, thanks to the rubber or leather exterior used to form the outer boot. Pac boots are also lightweight, when you consider the level of comfort and warmth they offer. They also provide good protection from snow and water. Due to the inner boot design, they don’t produce a nice or secure fit as you would expect. They also tend to be clumsier when you are walking in them, as compared to single-layered winter boots. Additionally, after some time, the removable inner lining tends to soften or wear down, which might leave you with a very loose and uncomfortable boot. Any single-layered winter boot that is insulated, does not have removable liner, and has a lacing system to provide a secure fit belongs to this category. Unlike the slip-on models and pac boots, insulated winter hiking boots are designed for long distance hikes. Therefore, they should have a perfect fit, without interior slipping. Insulated winter hiking boots are perfect for daypacking trips. However, they are not suitable for overnight winter camping due to their difficulty in drying as well as insufficient insulation. If you intend to have an extended winter camping expedition, then you should opt for double-layer mountaineering boots. How Do Winter Boots Differ From Summer Hiking Boots? Winter boots have certain features that set them apart from summer hiking boots. First, the material used on the upper should be highly impervious to wetness. That means that it needs to be 100% waterproof or at least water resistant since winter conditions are always muddy, wet or slushy. Secondly, they have a better level of insulation than summertime boots, if daytime temperatures are higher. Thirdly, since many winter hiking boots will be exposed to deep snow and other similar conditions, insulated winter boots should have a higher calf or shaft height to prevent slush and snow from getting inside the boot over the top. With so many brands, models and varieties of insulated, water resistant and comfortable winter boots to choose from, many hikers especially beginners might be confused. If you find yourself in such a situation, here are some of the factors to consider, when choosing the best boots for winter hiking. Winter hiking presents the perfect chance to pamper your feet. More often than not, people opt to sacrifice style over comfort during normal hiking conditions. However, in winter, you cannot afford to compromise on comfort. Cold temperatures and snow give you the perfect opportunity to leave behind your designer sneakers or heels, and go for something more comfortable. That is not to mean that you cannot have both style and comfort when it comes to winter hiking boots. There are various brands and models that have managed to blend style and comfort, giving you a perfect winter boot. The bottom line is, if you were to choose between style and comfort when selecting a winter boot, comfort should always take priority. When it comes to sizing your boots, you need to consider the circumstances under which they will be used. For example, a loose boot will provide great comfort and warmth over short distances. However, it will be very uncomfortable when you hike with it over long distances. Conversely, if you want a long distance snow hiking boot, go for one that provides a snug fit everywhere. Moreover, it should not be overly tight and should also leave enough room at the toe area for you to wiggle your toes. In this light, it is of the utmost importance to know the width, length as well as your foot’s arch length. You should also consider the type of socks that you intend to wear with the boots, during your hiking. Breaking the boots is also important, so that you can have a nice fit during the actual hike. Winter hiking conditions are usually characterized by mud, ice and snow. These conditions might cause you to slip which might lead to injuries, during the course of your hike. Therefore, when selecting winter trekking boots, ensure that have good slip resistance and traction. Watch out for traction features like treaded soles which will provide grip on slippery and wet ground. Winter boots are mainly preferred over regular hiking boots due to their generous insulation. To keep your feet warm during cold weather, they should contain some insulating material for trapping heat inside them. When insulation is combined with good exterior waterproofing material, the result is a reliable piece of footwear, which can perform excellently in both cold and wet environments. Most winter trekking boots have two main forms of insulation; neoprene and synthetic fiber insulation. However, neoprene is not as widely used as synthetic fiber insulation. In fact, it is more common Scuba diving wet suites and fishing gloves. It is durable and warm but very poor in terms of breathing. On the other hand, synthetic insulation is very effective in trapping heat especially when it’s allowed to loft. The amount of insulation applied, together with the sewing technique inside the boot will also affect the warmth and fit of the boot. Synthetic insulation is preferable over neoprene since it offers more cushioning and also feels softer. Preventing water or moisture from entering your hiking boots is important for several reasons. Once insulation becomes wet, it immediately loses its effectiveness. On top of that, cold wet feet are very uncomfortable. You will not enjoy your hiking when you are walking with wet socks and feet. Boot manufacturers rely on two main forms of waterproofing. First, some boots are made from materials that are entirely waterproof such as rubber or treated leather. Others are fitted with thin waterproof membranes, preventing the interior from external moisture. Fully waterproof materials like rubber and neoprene will keep moisture out, but the boot will not breathe. Therefore, try to strike a balance between waterproofing and breathability, whenever you are buying your winter hiking boots. The lacing system used will also affect the water resistance and fit of the boot. Pac boots usually have more eyelets which can provide a comfortable fit. However, it is difficult to secure a tight fit when the eyelets are too many. As much as many lacing eyelets enhance breathability, they are also opening up the boot for more water penetration. Go for a winter backpacking boot with a speed lacing system. With speed lacing system, you can get a secure, quick and comfortable fit. Are you looking for stylish and waterproof winter hiking boots? These warm winter boots can be used for hiking or daily commute in snowy and cold regions. Some of the features that make them outstanding include faux-fur at the collar and tongue, 100% waterproof membrane and woven synthetic material, among others. The combination of these features presents a nice and fashionable shoe. This one also features high quality traction sole, together with around 200 gram of Omni-Heat reflective lining for insulation and heat retention. All these components ensure that your legs are always warm, comfortable and dry especially during adverse weather. They also come with a removable footbed, which is made from contoured PU material, offering great support and all day comfort. The midsole itself offers good energy retention and cushioning, which can be attributed to the Techlite lightweight midsole technology for long-lasting cushioning and support. For the outsole, Columbia has used the proprietary Omni-Grip rubber. This rubber provides good traction, is non-marking and slip-resistant. This unique technology makes Columbia Women’s Minx Mid II Omni-Heat Winter Boot some of the best winter hiking boots. They can also be used for walking in snow and ice, as well as trail-running. The front part of the boot is made of high quality materials, for preventing the entry of snow or ice. There are some few observations, which make this boot stand out. The boot itself is around 10.5 inches high. This makes it more attractive and stylish, than most winter boots that you can find on the market today. This winter boot is also designed with a wide toebox, featuring quilted nylon material. This allows enough room for comfortable toe movements. In terms of material construction, this boot is very sturdy. It also provides enough foot protection, due to its comfort and flexibility. The unique trend design on the outsole of the shoe gives you the confidence and allows you to safely and easily navigate through any form of snow or ice. Apart from providing insulation and heat retention, the Omni-Heat reflective technology also releases excess body moisture and heat to the external atmosphere. This allows the boots to operate perfectly under different weather conditions. The waterproof nylon component, together with a breathable bottom, provides dry environment and good comfort for the legs. Are you looking for a pair of boots that can withstand the harsh winter weather and at the same time deliver a comfortable hiking experience? If yes, then the Dream Pairs DP should be an obvious choice. These winter hiking boots feature a sturdy, waterproof upper, which keeps your feet warm and dry even when you encounter snow, rain or other forms of condensation. Also, these boots are seam-sealed, thus adding another protection against water or moisture. Featuring 200 grams of insulation and a rating of -25F, these boots will keep your feet toasty, even during subzero temperatures. In fact, they are so warm inside that your feet will barely notice that it’s winter. Their lacing system features a standard lace-up closure, combined with straps on the calf. They also come with a side zipper. Therefore, you can easily adjust the fit according to your preferences. These winter hiking boots for narrow calves are further equipped with a shaft that rises beyond the ankles. The shaft opening is also lined with premium quality fur. As a result, your legs and feet will have ample protection against the elements. During the course of your hike, there is a high chance that you will encounter different conditions, from muddy trails to snow-filled terrains. Well, as long as you are wearing these boots, then you don’t have to worry about the trail conditions. These winter hiking boots for women are ready to tackle whatever you encounter along the way. They have a sturdy rubber outsole, which is also slip resistant. This outsole gives you a firm grip on the trails, thus helping you to hike faster and easier. At the same time, the rubber outsole provides additional protection from the elements. The KEEN Women’s Betty II Winter Boot is among the best women’s winter boots that you can get on today’s market. These warm and stylish boots surround your feet with absolute comfort from beneath the foot, all the way to the calf. With these boots, you will always look elegant, since thanks to the snowflake-shaped quilting on either side of the boots. This enchanting, yet simple design appeals to many outdoor women who are conscious about their style. You will not only feel safe and comfortable during the cold winter days, but also look pretty. If adventure is your thing, these ones will provide you with all the energy needed for an entire hiking day, during the cold season. The comfort and nice feel of these shoes is guaranteed by the high quality material, used to create them. With the efficient insulation provided by these winter hiking boots, you can spend your entire day hiking, and you will not encounter any fatigue or sore feet. If you can combine these ones with good quality socks, these gorgeous boots will keep you motivated, throughout your adventure. Talking about durability, you will be satisfied with the quality these hiking boots from Keen. The arrangement of stitched side boards, combined with nubuck cowhide material on the upper, gives them a long life. Despite the combination of these durable features, these ones are shocking lightweight. You will not feel as if you are dragging your feet through ice or snow. The double thickness EVA footbed, combined with EVA padded sole pads your walk, as you encounter those rugged trails. The interior is lined with dampness wicking material, together with a dry breathable layer ensures that your feet remain dry. Soles are non-marking and designed to provide sufficient traction, on wet, slippery or loose surfaces. Tall and warm, the Columbia Bugaboot Plus III XTM was specifically designed for winter’s harshest weather. These boots wrap your feet in incredible warmth, thus making it easier for you to tackle tough mountainous conditions. Featuring 600 grams of insulation, this all-purpose winter hiking boot will deliver a superb performance throughout the year. And despite its heavy insulation, Columbia has done a great job of ensuring that these boots remain lightweight. Their upper is made of a lightweight Techlite shell, featuring ballistic mesh and waterproof leather, resulting in rugged waterproof protection for your feet. These boots also come with gaiter hooks. Therefore, if you are looking for winter hiking boots for snowshoeing, then you should check out the Bugaboot Plus III Omni Heat. As noted above, these boots come with 600 grams of synthetic Omni Heat insulation, together with thermal lining traps. Thanks to these materials, you are assured of long-lasting warmth, regardless of the conditions that you encounter during your hike. The Bugaboot Plus III comes with an 8-inch shaft, with padded collars. Therefore, the shaft will not only protect your feet but will also supply additional warmth. And as much as the collar is padded, it doesn’t limit ankle mobility in any way. On the other hand, the compression-molded EVA midsoles deliver excellent cushioning to give you a comfortable ride for all types of terrains. On top of that, the nylon shanks that run the entire midfoot area provide torsional stability, especially when you are walking on uneven terrain. Winter hiking conditions are characterized by wet and slippery surfaces. But as long as you have the Bugaboot Plus III OH, then you don’t have to worry about sliding or slipping, thanks to their Omni-grip non-marking rubber outsoles. Turn those snowy days into fun and adventure, with the Merrell Women’s Decora Prelude Waterproof Winter Boot. These fashionable boots are designed both for everyday use and serious hiking during wet or slippery conditions. Their overall appearance is impressive. You might even think that they were designed for exhibition purposes during Paris Fashion Week! But who said that your winter hiking boots should look tired anyway? They are almost knee length, which means that your legs will be adequately protected even in deep-snow conditions. With a side zipper, you can easily slip them on and off. Materials used are synthetic and leather. Leather used is mainly pig suede. Therefore, if you don’t have any problems with animal products in general, these should be good shoes for your cold weather hiking. Featuring lightweight insulation and breathable mesh lining, your feet and toes will always remain warm, even when temperatures fall below zero. All this is achieved without weighing you down. You don’t want to feel as if you are walking around in concrete blocks! Unlike other lace-up boots, these ones are not flimsy. They have a firm, sturdy and well-made feel to them. The construction and workmanship is great, which is exactly what you would want, with such a price tag. They have a rubber sole, which can be found in sports shoes. However, these ones come with the extra benefit of keeping your feet much drier and warmer, while providing adequate protection to your calves. They are true to size while providing a warm and snug feel. It feels like a hug on your feet. We all love a warm and tight hug, right? With these ones, you will not experience wetness or cold. You don’t even have to rely on those thick heavy stockings. Thanks to their superior breathability, you don’t have to worry about your smelly feet. Your feet will always remain fresh and cool, with these insulated waterproof hiking boots. What more could you ask for? These versatile women’s boots are breathable, snug and waterproof so that your feet can remain warm, as you explore the great outdoors. The upper is made from woven synthetic textile, together with a faux-fur collar and tongue lining. Their tongue is attached just above the centre lacing loop. Unless you are hiking in deep snow, your feet will always remain dry. It is also waterproof, giving you the perfect hiking boots for those cold and wet days. Featuring Omni-Heat reflective lining, heat generated from the body is retained inside. A waterproof membrane prevents entry of cold of moisture to the interior of these boots, for dry comfort. A contoured PU footbed provides the necessary arch support. This footbed is also removable, in case you feel the need to replace it for more arch support. The Techlite lightweight midsole provide long-lasting superior cushioning together with high-energy return. With this superior combination, you will rarely experience fatigue or numbness on your feet, at the end of your hiking day. Featuring Omni-Grip advanced traction on the outsole, you don’t have to worry about slips or falls, when hiking on slippery surfaces. The Omni-Heat reflective technology also comes with a breathable membrane, allowing free air circulation. As much as they are able to retain heat, you will not experience smelly feet, even when you wear them for 24 hours. The circumference is adjustable. This has been intentionally done to ensure that the shoes can accommodate different calf sizes. Their traditional lacing closure provides an adjustable fit while their comfort and support enhance your cold winter days. You can combine these ones with different winter hiking outfits. They are easy to clean and maintain, and their durability is not questionable. When snow comes down so fast and hard, that should not be an excuse to stay indoors. Just lace up these winter hiking boots and get going. With these waterproof and super-warm hiking boots, you can either enjoy the power to explore the Everest or even go for elk hunting. What makes them so special? The TPU waterproof shell, together with the coated leather upper ensures your feet remain dry, even when walking through a slushy puddle. Additionally, the nylon panels on the upper combined with the thermoplastic urethane is designed to provide sure protection against extreme weather elements. Heel loops together with the lace-up design, provides a secure and quick fit. Snow and debris will never bother your feet, thanks to the baffled tongue and collar. Featuring 200g Opti-Warm polyester fiber insulation, you are guaranteed maximum warmth. These ones are also rated -40°F, which is just what you need, when hiking during freezing conditions. Soft polyester fleece linings have been treated with AEGIS Microbe Shield antimicrobial treatment to prevent odor development. For shock absorption and cushioning, these ones have Air cushion heel pods and compression-molded EVA midsoles. Stability and support is in adequate supply, thanks to the nylon arch shanks. These boots provide reliable traction, which can be attributed to the rugged rubber outsoles. They are compact, comfy and warm, which are the attributes needed for snowy are hiking. These Merrells are also roomy in the inside, and the toe box is flexible. Their fit is great and they also tend to very sturdy. They are one of those shoes that will not require a replacement any time soon. Their slim profile gives them a feminine appeal. They also tend to be very versatile, giving you a wide range of outfits to wear with them. Explore the outdoors in style, with these luxurious women’s boots. They can be worn for various winter activities, thanks to their combination of superior features. Whether you are strolling in the streets or just looking for hiking boots for your Everest base camp, these ones can work both ways. Featuring a full-grain leather construction, these ones will keep snow and water out, when you are handling those tough trails. They are perfectly suited for that winter that never seems to be ending. They are very warm and super cute. Featuring a traditional lacing closure, these hiking boots for elk hunting allow an adjustable fit. With the mesh lining on the inside, moisture is naturally licked away while ensuring all-day warmth and comfort. Overall comfort and coziness is enhanced by the 200g of insulation. With a durable rubber outsole, you are guaranteed sure traction and grip, whenever or wherever you might need it. From mountains to beaches, these shoes can be worn everywhere. With these boots, you can either tuck the pants inside, or even pull them over the shoes. If you are looking for a traction-soled, sturdy and waterproof winter hiking boot, this one is unbeatable. They are true to size, unless you want to wear them with very heavy or thick socks. If that is the situation, then you might want to order half a size or even a full size bigger. Slipping them on and off is fast and easy, thanks to the full-length lace-up closure. They are available in cool and vibrant colors and they are also quite light. You will not feel as if you are dragging your feet through snow. The KEEN Women’s Wapato Tall WP Boot provides sufficient foot protection. The KEEN Women’s Elsa WP Winter Boot is a short-cut and cute winter hiking boot without the normal fur cuff present in other brands. It is comfortable and warm for cold days, and can also be worn during warm weather. It is the perfect fall to winter transition boot. These shoes are available in different colors, but the black one is the most prevalent and common. This can be attributed to use and ease of maintenance. The shaft height is around 8.5 inches from the ground while the outsole gives you 2 inches of snow. Despite its lightweight feel and look, this one is very durable. It also comes with excellent traction, especially on those slippery icy surfaces. Thanks to the back pull tab, small eyelets and short shaft this one is easy to slip on and off. They feature a round rubber toe box which provides toe protection against impacts. The textile and waterproof PU leather on the upper repels water, when you are hiking in wet conditions. The entire shoe is seam-sealed to ensure waterproof protection as well as dry comfort. With 100 grams of KEEN warm insulation, these ones are designed to keep your feet warm, as you stroll along the streets, or explore the wilderness. For breathability and warmth, they come with a mesh lining and Sherpa collar. They also come with a heat reflecting strobel, which creates a thermal barrier for protection. You will also notice that once the shoes are fully laced, there is no much left over lace to drag around the ground or even tie around your ankles, which is the case with some shoes. Their small eyelets also ensure that the laces will never come off, once you have tied them. Therefore, you don’t have to worry about stopping in the streets or in the middle of something to tie them up. These winter hiking boots with removable liner don’t even require a break in period. They are also true to size. Complete your winter wardrobe with the BEARPAW Women’s hiking boots. Featuring a lightweight athletic construction and waterproof leather upper, these ones are designed for the ultimate thru-hiker. A rubberized toe cap provides protection to the toes and front of the foot. On the other hand, the wool blend lining makes sure that your feet will never experience any external moisture or cold. With a sheepskin footbed, you will be walking around in amazing comfort. Exceptional traction is provided by the lightweight rubber outsole while the construction with quality materials ensures that you can wear this shoe all year round. The laces are designed in a way that they can be easily loosened and tightened for fast and easy putting on and off. Since they are fully waterproof, you don’t even need to apply wax or other waterproofing materials. The position of the tongue is designed in a way that there will be no water leaks even when you are sloshing through water or snow puddles. Unlike other brands that are too narrow around the shaft, these ones come with the right size. They will not appear awkward when they are laced up. Plus size girls, as well as those with big calves will not have to worry about fit. In fact, once the fur lining flattens a little bit, you will be able to secure a better fit. They also provide great ankle support. Additionally, you don’t have to carry thick socks during your winter hiking trip with these boots, thanks to the generous amount of fur lining. The natural fur lining also ensures that your toes remain warm, which is a rarity. Most winter hiking boots are lined with quilt, which is not as effective as the material used in these ones. Battle the cold winter weather with style and comfort, with these amazing boots by London Fog. This is one of the most-established and oldest brands in the US fashion industry, and they still remain a big hit. They are designed to keep your feet warm and prevent them from getting wet in rain or snow. These winter hiking boots for very wide feet are also fully waterproof. You don’t have to worry about sloshing through a puddle of water or snow. They have a 6 cold weather rating, based on a scale of 1 to 10. With a shaft measuring 12 inches from the arch, they will cover the leg almost up to the knee, depending on your height. Upper is made of durable and lightweight synthetic, while the sole is manmade. The rubber sole comes with a unique lug design to make sure that you can navigate through wet or slippery snowy conditions easily. With fur lining in the inside, you will not have to worry about cold toes anymore. The opening is also fur-lined, which prevents cold air from entering the shoe. A round toe design ensures that your toes have enough room to wiggle and flex. Their lace-up system allows adjustment depending on your fit. It has also been designed in a way that you can loosen them easily, whenever you want to put on or remove these shoes. They are also very stylish and can be combined with different hiking outfits. The laces are thick and strong to make sure that the shoe remains laced-up, everywhere you go. Crafted from full-grain leather this one is designed for people who like to participate in winter sports, such as sledding or snowmobiling. It’s also suitable for fishing or hunting. That’s according to Sorel’s product description itself! They are fashionable and comfortable. As a matter of fact, they are so fashionable, that some Internet reviewers are of the opinion these are actually fashion boots, which aren’t fit for hiking. But they’re most definitely suitable for walking around outside when it’s snowy out. The Sorel Women’s Major Carly Boot is created from durable materials. This guarantees you long-term service, while ensuring that your feet are always protected, even when the elements are extreme. A side zipper has been included to make sure that slipping on and off is smooth and effortless. The side zipper also gives them a unique design while setting them apart from the usual knock-offs that try to imitate this brand. If you love some good wiggle in your toes, these are the shoes to order. These ones are true to size. Therefore, stick with your normal sizing, when placing your order. However, if your feet run wide, then you might prefer to order half a size up on your normal shoe size. If you want to wear them with thick socks, then order a full size up. Although they are designed for low arches, you can still add some orthotic inserts and enjoy the other superior features of these great shoes. When you wear them for the first time, you might feel as if they are squeezing your widest part of the foot. However, after a short time, they stretch out, and fit snugly, giving you that comfort that you have always desired. Sorel is renowned for making quality and durable boots, and these are no exception. Construction is solid and the workmanship is always what you would expect from a top shoe brand. There are no loose connections, missed stitching or parts falling apart. They have a very soft sole and they can be matched with skinny jeans, tights, leggings or whatever you would love to wear during your winter activities. The Women’s DailyShoes are among the best boots for winter hiking. They are simple to wear and comfortable, thanks to the luxurious Sherpa fleece lining, which keeps you warm throughout the day. The luxurious Sherpa lining, also provides sufficient insulation inside the boots. This ensures that body heat is locked inside, while keeping out winter cold. The padded collar and tongue are also designed in a way that air does not sneak out of the shoes. These ankle boots feature D-ring lace up system, which makes it easy to adjust, depending on the fit you prefer. With a shaft measuring 8.5 inches, these ones will provide sufficient cover to the ankles. On the other hand, the 12-inch circumference is lined with fleece, to make sure that you remain warm, throughout your hiking or backpacking trip. Regardless of how inclement the winter weather is, these boots will always provide sufficient protection. They were specifically created for the women who cannot allow snow to keep her indoors. Their rubber outsoles have uniquely engineered lug patterns to provide maximum and reliable traction even in slippery conditions. Moreover, the upper bottoms are reinforced to ensure that moisture does not leak in. This helps to keep your socks dry. Cushioned insoles provide foot support while providing just the perfect amount of padding, for comfort. If you tend to have wide feet, these ones are perfect for you. They also have a wide toe area and therefore you will not feel as if your toes are squeezed together. Unlike other boots, the tongue is attached to the entire boot. No spaces have been left on either side. This means that no amount of rain, wind, or snow, can sneak inside to get you wet or cold. Additionally, if your calves run wide, you will have sufficient space on these boots. A tab has been included at the back of the shoes, which can be used when putting them on. The tab can also be used to hang them when they have been washed. Get this durable and luxurious pair of boots and enjoy your winter. Be sturdy and safe, with the Icebug Metro BUGrip. Icebug is a Swedish company that is dedicated to producing safe and reliable boots. Their boots always have good traction, which makes them popular with winter hikers and backpackers. From the arch, the shaft is approximately 5 inches, thus providing ample ankle protection from the elements. The Metro BUGrip Studded outsole comes with 16 carbide tip studs for enhanced traction over slippery surfaces. The studs design, coupled with the properties of the rubber compound used produce a dynamic function. The studs have also been crafted in such a way that they are not fixed completely, and they can work independently from each other. Once you apply weight on the shoe, the studs push towards the sole surface. The pressure exerted as well as the resistance on the surface, will determine how far they push in. With the dynamic function, the studs are able to adapt to the surface, provide reliable and guaranteed traction, regardless of the surface. Fleece lining on the inside provides warmth. The upper features suede and Nubuck, which are materials known for durability. These ones don’t come with laces. Instead, the feature a convenient side zipper, for easy on and off. This lace less design minimizes entry of water or moisture inside. Comfort Zone Technology protects and insulates the foot, especially from cold emanating from underground. With the carbide studs, you will always remain standing, even when you encounter a patch of ice. If you want to wear thick wool socks during winter, order half a size up. Otherwise, they are true to size when worn with normal socks. You don’t have to walk like a duck or suffer from twisted ankles again during winter, once you add these boots to your collection. Enjoy the amazing durability and comfort of these waterproof hiking boots. Featuring seam sealed fabric and leather upper; these will ensure that no amount of wetness reaches your toes. For extra comfort, they come with a bellows tongue, which also prevents entry of debris into the shoe. With the M-Select DRY moisture wicking technology, your feet will remain cool throughout the day. This technology also helps to prevent buildup of bad odors. Additionally, the M-Select FRESH technology provides long-lasting comfort. A 200g, lightweight, low bulk insulation delivers efficient warmth, ensuring that your feet remain cozy. Removable EVA foobed together with faux fur collar, provide your foot with all the comfort needed, to get you through tough and rough hiking conditions. Support and stability is provided by molded nylon arch shank while the midsole deliver exceptional impact absorption. A 5mm lug depth on the M Select GRIP outsole provides grip and traction, on different surfaces. These hiking boots are really great for plantar fasciitis, because they come with great arch support. Lacing them up provides a customized fit. As an extra bonus, these boots are just cute and stylish. Your feet will always remain toasty warm. You don’t have to worry anymore when walking through slosh, ice or snow, once you have these winter hiking boots on your feet. You will also notice that they are roomy inside, without being sloppy. This means that your toes can wiggle as much as they like, and you will not end up with blisters or sore feet. If you have been buying winter boots that make you feel as if you are walking around with concrete blocks on your feet, these ones are lightweight, and just what you need during you outdoor adventures. Apart from being a quality product KEEN Women’s Hoodoo III Winter Boot are also eye-catching and stylish. Similar to most other KEEN products, these ones are made from oiled nubuck leather which is then seam sealed for water protection. They are available in different sizes and appealing colors for women who love outdoors. Although they were designed for winter, they can also provide a great transition from fall to winter, since they are not too thick or bulky. They can also be worn during any type of weather. From the arch, the shaft measures around 8.5 inches. They are one of the best insulated waterproof hiking boots, thanks to the 200g of insulation. These ones also have a faux-fur collar together with a thermal heat shield around the foot bed. All these features are included to make sure that your feet remain warm and dry, even when there is heavy snow outside. Walking in snow can be quite a challenge. However, you don’t have to worry about that with these boots, since they have a dual compound rubber on the outsole, designed to provide really strong grip on snow and ice. The good quality and adjustable laces can be loosened or tightened, depending on the ankle support that you prefer. With the inclusion of a gusseted tongue, snow will always be kept outside the shoe. In terms of durability, Keen products are known for longevity, with proper care and maintenance. When it comes to fit, these ones have a roomy inner space and fits wide feet perfectly. Since they are spacious, you can also wear thick socks, giving you a snug fit and providing an extra layer of warmth. A side zipper allows for an easy on and off together with accommodating women with larger calves. 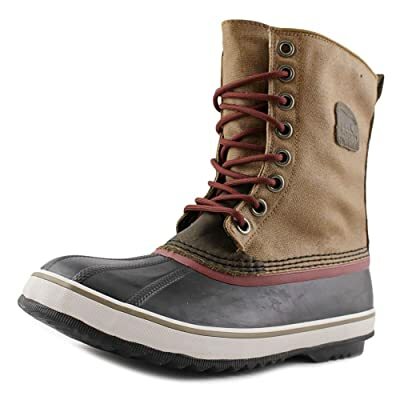 The Sorel Women’s 1964 Premium CVS Boot is designed for women who are active in outdoor winter activities. The uppers feature waterproof waxed canvases which are also seam sealed, to keep away water from your toes. These uppers rest atop waterproof, lightweight vulcanized rubber shells to provide excellent protection against the weather elements. A washable, removable 9mm recycled felt InnerBoot lines the inside of the boots and provides loads of warmth. This lining also dries quickly, when removed from the boots. Rubber insoles provide padding and shock absorption for all day comfort. If you have ever slipped while walking on snow, then you know how risky or embarrassing it can be. However, with the herringbone tread pattern on the outsoles of these winter hiking boots, you are assured dependable traction, wherever you go. You can walk through snow or slush, without worrying that moisture will get to your toes. They are fully functional and quality made. These ones tend to run wide. Therefore order at least half a size lower. You don’t have to worry about them being too tight with thick socks, since they already have enough room inside. Even if you order half a size lower, you still get room to wiggle your toes. The Sorel Women’s 1964 Premium CVS Boot is easy to break in, stylish and cozy warm. They are just the type of boots that you would need for the entire winter season. Many boots from Sorel are fashion boots. However, one Internet reviewer who mentioned he/she had bought these for a hiking trip and said they worked well. Keep in mind that this boot isn’t advertised as a hiking boot. If you are looking for one of the best insulated hiking boots for cold weather and winter hiking, then you should try out the KEEN Women’s Revel III. One of the main features separating these ones from the conventional hiking boot is the additional insulation which keeps your feet warm. The Keen.Warm wraps around your feet, especially around the ankles thus providing both support and warmth. The use of Keen.Dry makes the KEEN Women’s Revel III waterproof. This technology also helps to keep the cold out, and trap heat inside. Whether you are shoveling or walking through slushy trails your feet will always remain dry. To ensure that snow does not get inside the shoe, there is a gaiter ring on the front especially for compatible snow pants and gaiters. Since these ones don’t go all the way to the calf, the gaiter ring will come in very handy during extreme snow or icy conditions. If you intend to use these ones for winter summiting or snowshoeing, there are various technical features to facilitate that. First, the hardened rubber protection layer on the back helps to protect the leather from getting worn down easily. Secondly, there is the inclusion of a metal gaiter loop towards the front of the toe. Just like other Keen boots and shoes, an oversized rubber toe bumper helps to keep the toes protected while preventing the shoes from wearing down prematurely. For boot traction, this one works great under various conditions and surfaces. Hiking in the snow is a breeze. No slipping or falling over. For women who are after style, these ones still provide a clean casual look. They can be paired with jeans, khakis or whichever outfit you would want to wear them with. The Keen Revel III can be worn by different people, but they tend to perform better for women with wider feet. You should also note that the insulation will work better if you keep moving. If you will not be moving around, like a camping situation, double up on socks. The Timberland Keele Ridge is a top-rated winter hiking boot, which protects and keeps your feet warm while making it easy to tackle challenging snowy trails and terrains. These winter hiking boots for narrow feet are super comfortable. They don’t require any break-in period, and you can use them for hiking right away. Their uppers are made of premium leather and synthetic, with a pull-on tab at the rear to make it easy to wear them. And as much as they are designed as winter hiking boots, you can still wear them during warm weather hiking, thanks to their lightweight construction and breathability. If you are looking for a comfortable pair of mid-ankle winter hiking boots, then you can never go wrong with these. They provide adequate ankle support. Besides that, the cushioning around the ankles is comfortable and soft, which means that it will dig in or rub against your skin during long hikes. As much as they might be as stylish as other boots, they do their job perfectly. In short, they are functional and practical. Lacing these boots is easy and fast, thanks to their D-rings lacing design. Furthermore, once you adjust the laces, they locked your foot down in position, thus minimizing unnecessary movements. Also, these boots are waterproof. You can comfortably cross creeks and streams with them, and you will not experience any wetness on your feet. Also, they are easy to clean and maintain. Whether you are hiking on snow or ice, these boots will deliver a great performance, while ensuring your feet are safe and comfortable. Whether you are heading to the office, hitting your local coffee shop or you are heading out for a winter hike, sometimes you want a pair of boots that is both functional and stylish. Well, with the XPETI Demo, you don’t have to choose between fashion and comfort, since you will get both features in these boots. Their upper is made of fabric and synthetic and then reinforced with a waterproof mesh and Hydroshield waterproof membrane. Therefore, your feet will remain dry and warm at all times. Challenging terrain is a common feature of winter hiking. But as long as you are wearing the XPETI Dimo, your feet will be properly equipped to handle everything that comes your way. These boots come with a sturdy rubber outsole, which provides a firm grip on the trail when you are hiking. Apart from that, the aggressive lug design grabs rocks and loose terrain, thus giving you great traction to tackle different conditions. These women’s winter hiking boots come with a molded TPU. This feature ensures that your ankles are properly aligned regardless of the terrain that you encounter. On the other hand, the moisture-wicking mesh lining prevents the buildup of moisture and sweat inside the boots. These winter hiking boots for winter cycling are further equipped with EVA midsoles, which are sturdy but light. As a result, you will enjoy cushioning and shock absorption, without having to drag too much weight on your feet. Overall, these boots are super comfortable, supportive, and stylish. Furthermore, you can use them across various terrains. Also, slipping them on and off should not give you any problems, since they come with a pull-on tab located at the rear. Therefore, if a versatile hiking boot is what you are looking for, then you should try these. The Salomon Authentic LTR GTX is an all-rounded pair of winter hiking boots. It’s renowned for its exceptional waterproofing capabilities, top-notch comfort as well as incredible levels of support. And it offers all these great features without sacrificing agility and responsiveness. The upper features 3D Air Mesh technology, which allows free outflow and inflow of air. With this remarkable level of ventilation, your feet will remain fresh, even after a demanding day of hiking. Furthermore, the upper employs split leather that allows air to move freely without sacrificing protection and durability. These winter hiking boots for wide feet are further equipped with Gore-Tex comfort technology. This technology is windproof, waterproof and breathable. As a result, it will protect your feet from the elements to give you a comfortable hiking adventure. They also come with a toe cap at the forefoot area, which protects your toes against small rocks and roots that you might come across on your journey. On the other hand, the gusseted tongue keeps out trail debris while providing additional water protection. For the midsole, these boots feature injected-molded EVA foam, which is renowned for its remarkable responsiveness and increased bounce. As much as it might be slightly more expensive compared to ordinary EVA, you are assured of better impact protection as well as reduced fatigue. In addition, the Advanced Chassis technology supplies additional cushioning, shock absorption and stability. Meanwhile, the non-marking, Contagrip rubber outsole delivers a great blend of flexibility and traction. The Bugaboot Plus IV is one of the best winter hiking boots that you can find on the market today. They are designed to keep your feet cozy and warm while making sure that you have adequate protection to tackle rugged trails and terrains. These no-nonsense winter hiking boots are equipped with 600 grams of Omni-Heat insulation. Apart from keeping your feet warm, the use of Omni-Heat insulation helps to keep the weight of these boots at a minimum. The laces are easy to adjust. Once you pull them tight, you will lock in as much heat as possible, without making your feet sweaty. Also, their outsoles are made of burly, Omni-grip rubber, which provides additional heat insulation. And most importantly, there is plenty of room around the forefoot area so that your toes can wiggle comfortably. Water and moisture can lead to blisters, thus making it almost impossible to continue with your hike. Luckily, such challenges will never bother you when you are wearing the Bugaboot Plus IV XTM during your hike. These waterproof winter hiking boots come with a rugged outer material, which sheds water and snow efficiently. And if you will be hiking in deep snow, then you can extend their height using gaiters. Inside, the Bugaboot Plus IV XTM is spacious and comfortable. Its heel cup holds your feet nicely in place while the firm footbed supplies the support you need, especially during long hikes. Tying these boots is fast and effortless, thanks to their closed metal eyelets. Also, these boots open up wide when you untie, thus making it easy to slip them on and off. And once you adjust the laces according to your fit, your feet will remain in position throughout the trek. Featuring a wide range of lug sizes and shapes, these winter hiking boots for women deliver super traction and grip over a wide range of terrains. Their performance is one of the best when it comes to snowy conditions. Hiking in winter should no longer scare you, as long as you are wearing these rugged boots. You no longer have to fear the dreadful weather outside, as long as you have the KEEN Women’s Durand Polar Winter Boot. These ones are assembled and built in the US, using some of the best materials in the world. The waterproof textile and leather uppers come with waterproof breathable membranes for keeping your feet dry when walking through muddy and wet trails. The 400g Keen.Warm insulation, combined with charcoal bamboo keep your feet warm and toasty. Woolly removable thermal heat shield footbeds together with faux-fur collars trap heat inside the shoe, while preventing external cold from reaching your feet. Cleansport NXT provides natural odor control. Therefore, it doesn’t matter how long you have these shoes on, you will not end up with smelly feet once you remove them. The midsoles and the integrated polyurethane heel cushions provide your feet with all day comfort especially during extended hiking trips. Stability is always needed when hiking on rugged trails. This is provided by the thermoplastic urethane shanks present on these shoes. The outsoles feature dual compound rubber for dependable grip and traction on ice and snow. In terms of sizing, they run a tad small. Therefore, adjust accordingly. However, if your feet run narrow, then you might consider sticking with your normal size. You should also note that the footbed is removable. Therefore, if you have custom orthotics, you can use them instead. With a round toe area, you will always have space to flex your toes and spread them out. They might require some time to break in. Once that is done, they fit snugly and provide good calf support, so that they don’t slide around. The lace-up closure also comes with some hooks, which allow you to tighten them around specific areas such as the shin area, the ankle bed or the top of the foot. The rubbery toe area provides protection to the toes while protecting the uppers from wear and tear. If you are looking for winter hiking boots with arch support, then you should try out these ones. Here’s a bonus pic from a Boot Bomb fan named Debra, who purchased these boots on Boot Bomb’s recommendation. Don’t they look cute on her? Woolrich rockies booties are lace-up mid cut boots, featuring a wool upper and full grain leather for added longevity and comfort. The functional lacing closure offers a precise and secure fit. Lugged rubber outsole provides traction and grip on those slippery snowy surfaces. They also come with a felt-flex midsole combined with a stacked heel for a feminine appeal as well as added support. Comfort footbed reduces friction while the woolrich wool delivers a soft and velvety feel, all day long. With these rockies, comfort will always follow you wherever you go. These winter hiking boots are also water proof. You can walk through ankle high slush and snow, and your feet will remain dry. Despite their stylish and fashionable appearance, they can still be used for various outdoor activities. They have a very short break in period which would be a maximum of five hours after wearing them. After that, the combination of wool and leather will keep your feet warm and protected. Their D-rings are beautifully riveted, the stitching is sound and their overall construction is highly durable. For those whose feet run wide and they intend to wear thick socks with these boots, then it’s advisable to order half a size bigger than what you normally wear. They also breathe well and they are not heavy like most other winter hiking boots, which make you feel as if you are wearing gum boots. These ones also don’t feel heavy or clunky, like most winter work boots. The shaft measurements are 5.5 inches while the heel measures around 1.25 inches. If you are a keen hiker or backpacker, then you understand that seasonal changes are not a hindrance to your outdoor fun, but a mere challenge. The right footwear will see you through all weathers, from spring to autumn. One such boot is the Vasque Women’s Snowblime. This is one durable and tough piece of footwear. Apart from being completely waterproof inside out, it gives you the guarantee of total comfort using the CuShin comfort technology. This technology eliminates shin discomfort, which is always a problem with boots that have longer shafts. Regardless of the situation or condition, these ones will always perform excellently. Whether it is a winter stroll, rock climbing or a winter thru-hike, these shoes can handle everything thrown at them. The outer leather shakes off snow while the 200 grams of Thinsulate internal insulation locks in warmth where it is much needed. This is an important factor, if you want to forget about your feet and focus on your surroundings and scenery. When walking or hiking in slippery conditions, the Vasque Women’s Snowblime is unfazed. The hard-wearing Vasque-venture sole sheds off dirt easily, snow or mud while guaranteeing safe traction. They have been designed to easily tackle the harshest of the weather thanks to the winter-specific design and features. These ones are crampon and snowshoe compatible and they also offer superior ankle support. Fleece lining has been added at the collar to provide additional comfort. If you have flat feet, then you don’t have to worry. You have already been taken care of by the Perpetuum Last feature on the boots. This feature ensures that the toes can spread naturally and wiggle. Despite being lightweight, these ones can endure even the toughest terrain. It features advanced technology throughout to deliver excellent performance, mile after mile, day after day. Salomon is a popular brand when it comes to hiking footwear. They have been in the industry for more than 60 years, which gives you the surety that you are purchasing a trusted product. If you are an avid winter hiker, then you understand the importance of hiking boots with ample ankle protection, arch support and warmth. Therefore, it is important to purchase quality hiking shoes that will keep you warm and safe, regardless of the weather. The Salomon Men’s Quest 4D 2 GTX Hiking Boot is one such shoe. With their powerful look and design, you get that confidence that your feet are surrounded by safety and protection. Salomon always pays good attention, when it comes to details, and these ones are not exempted. The whole upper part features seam-sealed Gore-Tex membranes providing excellent water protection. Apart from being waterproof, the membrane also allows vapor to escape, ensuring that the feet remain cool and dry. The combination of nylon mesh with the durable split suede leather makes them flexible, lightweight and comfortable for hiking. These materials are also breathable. Therefore, regardless of how many layers of socks you wear, you will never feel as if your feet are trapped. The shaft measurement is around 6.75 inches from the arch. This height is perfect your ankles and keep them warm. On the other hand, the powerful lace closure system makes it practically impossible for snow to penetrate the interior of these boots. Dual density EVA midsoles provide long-lasting support and comfort. They have also been enhanced with thermoplastic urethane to control and support them. This reduces ankle strain, keeps you fully stable and protects your feet against rough terrains. The outsoles are made of super durable rubber. It also offers a very stable grip whether you are walking on snow, rocks or dirt. Hiking boots should always have a toe bumper, and this company has adhered to that rule. The heel slings and the rubber toe caps protect the uppers and toes from abrasion and bumps. If you intend to wear these when hiking in snow or in the woods, then you will have no worries. You can afford to concentrate on your hiking and let the boots take care of your feet. Created from sheath fabric, the laces are raw and tight enough to provide a tight fit as well as a soft flex. The KingShow Men’s Waterproof Leather is one of the top men’s winter boots. Made from a combination of natural fabrics and synthetic materials, these winter hiking boots are designed to provide the perfect combination of comfort and warmth, without being too rigid or heavy. Featuring 100% waterproof leather uppers and a duck boot toe, these are designed for heavy duty hiking and backpacking. With a single piece bottom sole, these ones will definitely serve you for long. These provide good arch support and they are true to size. The laces provide a secure fit without being too restrictive. The long laces can also be tied around the ankles, to provide extra support. Moreover, the seams are solidly constructed to make sure that water does not penetrate inside these shoes. Therefore, you don’t have to worry when walking under water or rain. Apart from that, the sole is made of durable rubber. The durable rubber outsole comes with unique lug design and tread pattern, providing traction and grip, especially when hiking through slippery or muddy trails. With the internal lining, these will keep your feet warm. In terms of size, these ones run a bit narrow. Therefore, if you have wide feet, choose a wider width where necessary. The padded collar and tongue give you walking comfort while providing additional layer of warmth. The tongue also extends above the collar, to prevent debris and snow from entering the show when you are hiking. A wide toe area gives you enough room to flex your toes. Deep snow hiking, demands superior protection and waterproof protection. That is exactly what you get, when you go hiking with these boots. It is the ideal winter hiking boot for men who dare to tackle those slippery, rocky and rough trails and terrains. These provide great ankle support thanks to the firm upper part. Although the firm part might slightly reduce flexibility, it goes a long way when it comes to protecting and preventing broken or sprained ankles. As previously indicated, this is the ideal winter hiking boot for deep snow. It is fitted with a snow gaiter that has a barrel lock for allowing it to be securely tightened against the leg. The extended rubber lower offers 100% waterproof protection. This means that you don’t have to worry when walking through slosh or mud. Another feature that makes these top of the range boots for cold weather hiking, is the -40 degrees rating. With this in mind, these can be comfortably worn during cold weather for the whole day. You should also note that they will require one or two days for breaking in and getting used to them. However, once they stretch, you will have one of the most comfortable waterproof winter hiking boots. These are perfectly suited for that hiker that wants a boot that can be relied upon in different conditions. They provide warmth thanks to the 400g Thinsulate Ultra Insulation without addition of too much weight. Apart from that, you get solid ankle support as well as reliable traction on all manner of wet or slippery surfaces. With the addition of a snow gaiter, these should be your preferred boots for those rocky or rough areas. They can also be used as hunting boots, especially during inclement weather. They are seam-sealed to keep out any form of wetness or moisture while the molded EVA midsoles offer cushy underfoot comfort while improving thermal protection. Some professional hikers are of the opinion that Sorel Pac boots aren’t serious options for hiking. It all kind of depends on how easy or hard your hike is. Use your own common sense before purchasing these boots. Columbia provides a wide range of durable winter boots, and the Bugaboot Plus III Omni is one of them. Bugaboots are available in various styles, but the Bugaboot Plus III is the best if you want a hiking boot for cold and wet weather. It has superior insulating ability together with excellent traction, which are two great features for winter hiking. They use Omni-Grip non-marking rubber that comes with a customized lug tread pattern for maximum traction in ice and snow. They are super lightweight, featuring ballistic mesh and leather uppers. The combination of these features creates a sturdy weatherproof platform for protecting your feet. The inclusion of gaiter hooks makes them perfect for snowshoeing and mountain trekking. The insulation aspect is where these boots score high. Featuring 600g Omni-Heat synthetic insulation together with thermal linings, they are able to trap and reflect heat generated from your feet, for lasting warmth. Their flexible collars promote freedom of movement without compromising protection. For easy slipping on and off, you have the tongue and heel loops. Excellent cushioning is provided by the Compression-molded EVA midsoles for all forms of trails and underfoot conditions. The nylon shanks deliver torsional stability especially when you are trekking or walking through uneven terrain. The rubber outsoles on these are weather sensitive. This means that they can provide varying hardness, which enables them to adjust to all types of terrain and weather conditions. The Techlite lightweight midsole provides great energy return. In simple terms, you will not experience foot fatigue which allows you to hike longer. The Omni-Heat technology also ensures that they are breathable. You therefore get a warm shoe and one that is not smelly or stuffy inside. For these ones to provide waterproof protection, ensure that you are moving. The Merrell Men’s Moab Polar is a rugged winter hiking boot, designed to keep your feet dray and warm. Apart from keeping your feet warm and dry, they provide great stability, especially on wet, slippery and loose surfaces that are very common in winter. With the M-Select FRESH natural enzymes, you are assured that natural odors will not develop inside these boots. Uppers are made from mesh and suede. In terms of fit and finish, these are exceptionally made. They will fit your feet comfortably and well. However, if you have wide feet, then these might run a tad smaller. Therefore, buy a slightly bigger one for a perfect fit. Putting them on and removing them is easy and they don’t even require a break-in period. When it comes to warmth, these ones have 400g of insulation. They will sufficiently handle various trail conditions from mild to wet. The synthetic insulation retains and reflects body heat while allowing vapor to escape. They also have protective waterproof shells, which seal out water. Talking about traction, the Merrell Men’s Moab Polar are fitted with the proprietary Ice Grip sole. This sole tends to be much stickier and softer than a normal one. The addition of a versatile tread pattern provides the much needed sure footing on various terrains and trails. In terms of height, they are about an inch or so above the ankles. Shaft height is always a matter of personal preference as well as the intended usage. They also have a great design, and their overall look is also appealing. They fit nicely and snugly around the ankles, which helps to prevent hot spots and blisters. These are also durable. With the right care and maintenance, they should last you a good while. These stylish, functional and ultra-comfortable boots will be your close companion during winter. They feature suede upper together with fluffy wool lining, to make sure that your feet are always warm. The inclusion of TPR ripple bottom provides added support and traction. These winter hiking boots are designed to provide long-lasting comfort, wherever winter takes you. Whether you are in the backcountry hiking or riding your bike, these should be your preferred shoes. If you are also looking for hiking boots with a firm sole and wide toe box, these fit the bill perfectly. When buying sheepskin shoes, you should remember that most people don’t wear them with socks. Therefore, consider this factor when it comes to size since they may not have enough room for socks. You will also note that these and other sheepskin shoes tend to be snug, when you wear them for the first time. However, after some time, the sheepskin lining will conform to your feet. This implies that if you order these boots and they feel loose like a normal boot, they will be too loose, which will present you with problems when walking. You should also treat the leather first after buying these ones, to enhance their water resistance capacity. This is important if you intend to use them in extremely wet conditions. Shaft measures around 7 inches from the enough, which is good height for protecting your legs from weather and debris. The opening of the boot measures around 14 inches, which is intentionally designed to accommodate varying calf sizes. They also come with a sherling footbed for shock absorption and providing foot stability. The tread pattern on the non-marking outsoles is designed in a way that ice does not fill up the treads, which would reduce the traction. Whether you just want to brave winter streets or you just want a rugged shoe for winter hiking, the Polo Ralph Lauren Men’s Dover III will keep your feet comfortable and warm, wherever you go. Featuring a sturdy nubuck upper that can withstand the elements, together with a rubber sole for support and traction, these winter boots have the feel and look of any great occasion. They have a high top silhouette which provides sufficient ankle protection. On the other hand, the midfoot straps give them a stylish accent together with a personalized fit. You don’t have to abandon your style during the cold weather, thanks to these classic boots. These ones come with a lace up front enhanced with antiqued metal gourmets for that rugged and rustic style, which will always stand out, even in ice and snow. These duck-inspired boots are fitted with an adjustable strap for providing an extra secure fit. A deeply treaded sole provides good grip, wherever you go with them. They also come with a padded collar and tongue, for added comfort while keeping debris out. A cushioned insole absorbs underfoot pressure, provides energy return and provides additional comfort. In terms of construction, you will rarely notice any misplaced stitches or even the soles separating from the upper. They can serve you for more than seven years, and still retain their comfort factor. The Polo Ralph Lauren Men’s Dover III Boot are one of those shoes that never seem to go out of style. The rubberized material at the front ensures that your toes are always protected when you strike your foot against rocks and tree stumps. It also protects the uppers from wearing out. The same rubberized material has been fitted at the back to prevent moisture from leaking inside the shoe. Whether you are trekking across snow-filled mountain trails or you are just looking for a protective, warm and comfortable pair of winter hiking boots, then you should look no further than the Salomon Toundra Pro. These lightweight boots are perfect for winter hiking and snowshoeing. The upper features 100% waterproof synthetic material, with a cold weather rating of -40F. These boots are insulated with Aerogel – one of the most efficient and effective forms of insulation available today. Unlike other forms of insulation used in winter hiking boots, the Aerogel foam doesn’t rely on loft or thickness, thus making it perfect for cold weather conditions. Despite their exceptional levels of insulation, these boots are so light that you will feel as if you are wearing a pair of training sneakers. Therefore, they will significantly reduce the amount of fatigue that you would experience when breaking trails or during steep ascents. Apart from the Aerogel insulation, these winter hiking boots with good arch support also come with faux fur lining, which provides additional warmth and comfort. Their toe box is spacious, thus allowing enough room for wiggle. On the other hand, a gusseted tongue supplies additional protection against trail debris and water ingress, with a clearance of 5 inches. Their upper is fully waterproof, which means that moisture will not reach your feet. And as much as they are waterproof, they allow enough circulation of air, to keep your feet fresh and comfortable. Once you slip on these boots for the first, time, you can tell immediately that you have invested in quality footwear. Also, they offer maximum flexibility. These super comfortable winter hiking boots for men also come with a pull-on tab at the rear, which provides an easy on and off. You can now trudge through snow and ice with confidence, knowing that your feet are protected against the elements, thanks to the Salomon Toundra Pro. If you are looking for winter hiking boots that you can use to slog your way through mud or blast through the snow – while keeping your feet comfortable, then the UGG Hannen TL is a perfect choice. These men’s hiking boots for cold weather are ready to tackle whatever you might come across during your hike. As much as they might not flashy or stylish, they get the job done with minimum ease. They feature a refined leather upper, which is seam sealed and waterproof. Therefore, whenever you are hiking with these dogs, your feet will never have contact with any form of moisture. And with a shaft that rises 7 inches from the arch, you no longer have to avoid early morning hikes due to wet blades of grass. These boots will supply all the protection you need. Their interior is fully lined with UGG pure wool lining, which helps to keep your feet warm and cozy. On the other hand, a Vildona and foam insole provides cushioning and shock absorption, while enhancing support. If you will be out hiking in the wilderness for an extended period, then these boots will make sure that you have sufficient warmth, protection, and support to keep going. These winter hiking boots for arthritic feet are further equipped with a Treadlite outsole, which provides lightweight cushioning, durability and most importantly, traction. And with a shaft that rises 7 inches, a lightweight construction as well as an extra set of laces, the UGG Hannen is your ideal hiker for use when it’s snowy outside. The Sorel Men’s 1964 Pac T is a versatile boot that can be worn as you rush to the grocery store or are simply wanting to enjoy your skiing trip with warm feet. They are soft and comfortable on the inside, and easy to use. Just like other boots in the 1964 series, Sorel has used a recycled felt liner. Most hikers are conscious about nature and environment, and these boots help to push that agenda forward. With a temperature rating of -40 degrees F, you are guaranteed to remain warmth and dry, even during those days when there is extreme ice or snow. These come with a vulcanized rubber sole attached to full-grain leather upper with the help of sealed seams. These seams don’t allow even a drop of moisture to creep through the boots. These boots have been very popular all along, due to their ease of putting on and off. They also give a comfortable fit, either when you want them to fit snugly or you just want to leave them loose for fast slip on. The herringbone pattern on the sole works well on slippery and wet surfaces. The Sorel Men’s 1964 Pac T comes with handy pull on tabs both on the outer boot and the liner making them easy to use. You can secure the laces tightly if you are headed for a longer journey, or leave them loose as you take your strolls along the streets. The opening is also large enough, which allows you to stuff pants legs inside them. The felt liner is removable, in case you want to wash and dry it. Mind you: many people are of the opinion that Sorel Pac boots are totally unfit for actual hiking. The Merrell Thermo 6 is a sturdy, no-nonsense pair of winter hiking boots, designed to tackle heavy-duty snow hiking. They are made of sturdy leather and durable rubber outsoles – a combination that will ensure that your feet are not only safe but also comfortable. If you are hiking during winter, it’s obvious that you will encounter wet conditions every step of the way, from slush-filled trails to ice-capped mountains. And these conditions can make your hiking unbearable and challenging. However, with the Merrell Thermo 6, you are adequately equipped for all types of winter hiking conditions. These boots feature 200 grams of insulation. Therefore, even if it’s freezing outside, you can rest assured that your feet will remain warm and dry all through. They will keep your feet warm even during the coldest of winters. As much as these boots are remarkably warm, the insulation doesn’t add lead to increased weight. They will keep your feet light so that you can hike faster and longer while minimizing fatigue. The waterproof membrane used on the upper is also breathable. Therefore, if you are looking for hiking boots for winter and summer, then you should check out the Merrell Thermo 6. Apart from promoting air circulation, the breathable mesh lining also prevents the accumulation of sweat and unpleasant odors. As a result, your feet will remain cool and fresh. Designed to provide a comfortable hiking experience, these winter hiking boots with arch support are further fitted with an air cushion around the heel, which provides stability as well as shock absorption. These boots are also equipped with molded nylon shank that provides you with reliable support throughout your trek. Regardless of the hiking surface, you come across, these boots will keep you steady on your feet while providing adequate levels of traction, thanks to their rubber outsoles. Winter might be hard on your bills but it should not be hard on your feet, thanks to the Merrell Thermo 6. They will deliver a comfortable ride while making sure that your feet have adequate protection from the elements. The Vasque Snowblime Ultradry is an ideal choice for those who prefer stiff winter hiking boots. These boots will keep you going despite all the efforts of winter weather to keep you inside. Whether it’s rock climbing, snowshoeing or a winter hike, these shoes are designed to keep you going, even during the most demanding weather conditions. The sturdy leather upper protects your feet against snow while the 200 grams of Thinsulate insulation maintain optimal warmth and comfort. With these shoes, you can focus on the amazing scenery and forget about your hike. After all, isn’t that what hiking is all about? When you come across slippery conditions, you don’t have to turn back and abandon your hike. These winter hiking boots for men are fitted with a hard-wearing sole, which supplies guaranteed traction while shedding off dirt, snow, and mud easily. Also, these boots are crampon and snowshoe compatible. Therefore, if you will be hiking in an area that requires crampon, then you don’t have to carry an extra pair of shoes. The Vasque Snowblime Ultradry are ready for such conditions. Apart from that, their collar is lined with fleece, which provides additional warmth and comfort. And if you are looking for winter hiking boots for flat feet, then you now have a solution. These boots are designed in a way that allows your toes to spread naturally. Under your feet, the molded EVA midsoles, combined with dual density EVA footbeds will support and cushion your feet. Meanwhile, the TPU shank stabilizers will ensure that your feet are properly aligned at all times, thus preventing pronation-related issues. The forefoot area features a rubber toe rand, which not only protects your toes but also enhances the durability of these boots. With such a rich array of protective, comfort and supportive features, it’s easy to see why these boots are popular with winter hiking enthusiasts. Are you planning to hike your local mountain this winter or snowshoe over the weekend? It doesn’t matter how cold or slippery it will be, the Merrell Thermo Vortex can get you there comfortably. Designed to protect your feet from the elements, these boots come with uppers made of mesh and suede. They are further reinforced with thermoplastic urethane shells, which are highly waterproof. On top of that, they are equipped with 400 grams of Thinsulate synthetic insulation, which supplies adequate warmth throughout the hike. The shaft rises 8 inches from the arch, to ensure that your feet and legs have adequate protection against the elements. Furthermore, the collar is sufficiently padded for additional comfort. If you are looking for winter hiking boots for snowshoeing, then you should check out these boots. They feature a snowshoe strap ridge as well as Gaiter D-rings, which make them suitable for all types of snowshoeing activities. They feature a combination of lacing eyelets and metal hooks, which make it easy to obtain your preferred fit. On the other hand, the rear pull-on tab makes it easy and fast to slip them on and off. Similar to other winter hiking boots from this brand, the Merrell Thermo Vortex features M Select Dry membrane, which keeps water out while allowing moisture and perspiration to escape. Merrell has employed the M-Select Grip outsole on these boots, to ensure adequate traction on different surfaces. Also, this rubber is highly durable, thus helping to extend the life of these men’s hiking boots. On the other hand, the FIT.ECO contoured EVA footbeds provide shock absorption and cushioning while the insulated wool lining prevents the growth of odor-causing bacteria. These lightweight winter hiking boots also come with the proprietary Merrell air cushion around the heel area for stability and additional shock absorption. These are water-resistant, multipurpose boots, which can be worn for hiking and jogging, among various outdoor activities. Despite being lightweight winter hiking boots, they are sturdy and rugged enough, to handle heavy jobs. Padded tongue and collar provides a supportive comfort fit while preventing entry of debris. To meet your style and fashion needs, they feature a grey suede combined with nylon mesh upper. The Storm Defender waterproof and breathable membrane makes sure that your feet are always dry, in both wet and hot weather. Also included is an abrasion resistant toe bumper for providing extra long wear whether you are on a work site or on the trails. There are additional comfort features apart from the soft upper materials. Once you slip on the shoe, you will notice that the inside is fully lined using moisture-wicking and long-wearing material. You don’t have to worry about damp socks occasioned by accumulation of sweat. The moisture-wicking material makes sure that your feet are always dry. Supportive polyurethane cushion insoles provide additional comfort. The insoles are also removable, which is an advantage for those who prefer custom orthotics due to various foot conditions. These ones are durable and lightweight. You might even confuse them for trainers or sneakers, until you wear them for a winter hike, and realize how rugged they are. The durable rubber lug soles, combined with the shock absorbing EVA midsole are strong enough to handle even the most challenging terrains. The outsoles also feature rubber lug pods, which are strategically positioned to provide good ground contact for long-wear traction and slip resistance. Nylon shanks have also been included in these work boots, to provide lateral stability and support. It has good ankle support without being stiff. They are also flexible, conforming to the movement and alignment of your feet. With the composite toe construction, sizes seem to run a bit large. Therefore, unless you intend to wear them with thick hiking socks, you should go for half a size smaller. The adidas Outdoor Men’s Terrex Conrax CH CP Hiking Boot is one of the best hiking boots for men. They are comfortable boots that combine an athletic feel with cold weather or winter outdoor activities. The combination of climate-blocking mechanisms and athletic performance, gives you an aggressive and versatile boot, which can be used across the seasons. In terms of fit, it is one of the best when compared to other good hiking boots for winter. With 200g of Primaloft Sport insulation embedded into them, your feet will remain warm, even when it’s freezing outside. They are designed to provide good weather protection, especially when you are moving around. With the lace covering, you have an extra barrier that prevents the escape of heat. Featuring the proprietary ClimaProof waterproof membrane from Adidas, these ones are able to shed most slush and snow, which you will encounter during your adventures. A lace covering flap has also been added to protect the permeable area. This flap prevents buildup of ice and snow especially at the top of the boot. It also prevents infiltration of moisture into the boot. With a slim cuff, you can wear these ones under most hiking pants. This is a good feature because once the cuff is exposed, it can act as a sponge material, thus soaking up water and staying wet. Since they have a lower calf than most wet weather hiking boots, it would be advisable to use a snow gaiter. However, you don’t have to worry about that, since there is already a gaiter loop provided, which is usually concealed under the lace flap, when it’s not in use. Slipping on these boots is like blinking your eyes! They are cushioned and soft. They also fit snugly, which can be attributed to the speed lacing system. The ankle is adequately protected but not stiff. This allows them to provide a wide range of motion. The use of speed lacing system saves you time, especially when you are in a hurry. Insoles are properly cushioned but you can also replace them with aftermarket varieties, for a greater arch support especially on those long hikes. They are true to size, and still leave enough room if you want to wear thick winter socks. Featuring Continental Temperature Sensitive rubber, they come with an aggressive sole pattern, giving you a lot of confidence, regardless of the surface. An included heel counter allows you to attach micro straps and crampons, in case you need better traction. Whether you are going for a day hike or an extended backcountry hiking, these provide a good combination of performance and comfort. The Salomon X Ultra is a lightweight pair of boots, which is excellent for snowshoeing and winter treks. In terms of comfort, these boots resemble ordinary running sneakers. However, their rugged construction combined with advanced technical features leaves no doubt as to what their best application is. Featuring 200 grams of Thinsulate insulation, these boots have a temperature rating of -10 to -20F. They are also fitted with a Climaproof water membrane, which protects your feet against external moisture and water. These winter hiking boots for fast walkers also come with a seamless inner bootie for additional warmth and comfort. Therefore, they are perfect for hiking in cold weather conditions. These boots combine great technical features without sacrificing comfort. Also, they are lightweight, and they will only require a minimal break-in period. They will adjust to the shape of your feet within a few hours of wearing them. The shaft rises 7 inches with an opening that is lined with fluffy fleece. The fleece lining helps to lock in warmth while preventing painful rubbing or blisters. Their tongue is gusseted, and as it wraps around your foot, it helps to prevent heat loss and water leaking. Their lacing system is standard, featuring rust-proof eyelets for durability. For the outsole, Salomon has employed Contagrip rubber, which is both flexible and sturdy. The outsole features a set of high-density outer lugs and low-density inner lugs, which provide traction in cold and wet conditions. On the other hand, a molded midsole shank supplies torsional rigidity while the Ortholite insoles provide cushioning and shock absorption. If you are looking for a versatile pair of snowshoeing and winter hiking boots, then you should give this model a try. Style and warmth are yours when you rock the Timberland Men’s Chillberg Mid Insulated Boot. It is an ideal choice for warmth and traction, which are much needed during winter hiking. They are lightweight but insulated. These can double up as your every day casual wear or your reliable hiking boot. They also come with the durability and comfort that you would expect from the Timberland brand. Created using premium full grain leather, these are not the type of shoes that fall apart after wearing for a few months. They are designed to keep you going for as long as you can. The use of a fully gusseted tongue gives you the comfort needed during your hike, while keeping debris out. With these boots, your feet are properly cushioned, thanks to the Shock absorbing EVA midsoles. Rubber lug outsoles provide protection, traction and durability on different surfaces. These are also fully waterproof, which is provided by the waterproof membrane keeping your feet comfortable and dry in all types of weather. Additional comfort is provided by the Climapath technology vents, which allow moisture to escape from the shoes while ensuring that your feet remain drier. The contoured sockliner offers additional underfoot comfort. As you might have noticed, 90% of the features on these winter boots are meant to provide comfort. If you have been looking for winter hiking boots for elk hunting, then you should try out the Timberland Men’s Chillberg Mid Insulated Boot. They might require a short period for breaking in, which is a common feature with most leather boots. However, once you get used to them, they are one of the best hiking boots for winter hiking. The Kamik Men’s Blackjack Boot is one of the top ten winter hiking boots for 2019. With more than 100 years in the industry, Kamik knows what works and what does not. They know that some of the best and most beautiful sightings are only possible in the harshest winter conditions. That is why they bring you this dependable and strong winter hiking boot to make sure that you don’t miss out on anything. These backpacking boots are designed to deliver reliable protection and superior comfort even in the most extreme weather conditions. You might be asking yourself what makes these one so dependable. Well, they combine various features to make sure that you don’t use winter as an excuse to stay indoors. As you might have expected, they are 100% waterproof. When you combine them with two pairs of socks, you will not have to worry about the depth of the snow. You can pass through slosh and those muddy terrains, as if you are walking on dry ground. When they are tied, they are narrow enough to fit under a pair of dress pants. This feature protects you in two ways. One, the boots will not collect moisture or soak in like a sponge. Secondly, there will be no room for moisture to creep through. They are also properly constructed. Seams are sealed and the stitching is up to standards. They are one of those boots when you can find absolutely nothing to complain about. The tongue is sewn to the rest of the boots, to provide better waterproofing. A nylon loop is also included at the top of the boot. This loop can be used when slipping them on or hanging them out to dry. As you tie the laces, loosen them a tad bit at the top, so that they don’t get too stiff. These waterproof winter hiking boots are made from high quality leather giving you complete convenience and comfort in any surface. Whether you are hiking on snowy trails or muddy mountain terrains, you always have the full support provided by these boots. They are fully waterproof, giving you the confidence of passing through slush, snow or ice and your feet don’t get wet. Their adjustable lace-up closure gives you the perfect fit while the artificial velvet lining is designed to keep your feet warm. If you have plantar fasciitis issues, ensure that you get some insoles, to add to what is already provided. They are flexible and light. Their aggressive tread pattern will get you through the deepest of snow. Another reason why you should go for these shoes is their durability. Construction is very solid, the uppers are sturdy and the rubber soles are not going to wear out prematurely. These shoes are also true to size. However, you should order a slightly bigger size if you have wider feet or if you plan to wear thick winter hiking socks. If you have normal foot volume, you will have some room to wiggle your toes. Quality and comfort wise, they don’t disappoint. The use of metal eyelets ensures that laces don’t cut into the upper material, especially when you tighten them. Padded collar and tongue provides additional comfort. For extra protection against water, the lower part of the boot is entirely covered with a rubberized material. Timberland has been around for more than 40 years, and its classic design remains a top seller even today. They feature premium waterproof leather for keeping your feet warm and dry. The use of anti-fatigue technology ensures that you can hike with these classic boots for long hours. Seam-sealed construction provides further protection against water. Rugged lug soles gives them the ability to take on any surface, without slips or falls. With 400 grams of PrimalLoft ECO insulation, your feet are enclosed in warmth and comfort. Designed with a low padded collar, they provide a nice fit around the ankles while also keeping out debris. For long lasting wear, they come with durable anti-wicking laces. The rustproof footbed and shaft are lined using soft leather. On the other hand, forefoot and toe box are lined with breathable and moisture wicking material. Soles are durable, strong and come with a specialized lug design, for a reliable traction. The shaft measures around 4.25 inches from the arch, which should be enough to provide protection up to the ankles. Apart from providing protection to the ankles, the padded collar also prevents chafing, especially when hiking for long distances. They are accurate to size. Muck Boots are well known for their high quality and durability. They are designed to handle even the toughest conditions. These versatile boots are ideal for slush, mud or snow. Easy to slip on and off, these ones come with the Muck’s XpressCool lining together with sockliner technology. These features displace heat through the reduction of friction while keeping your feet comfortable and cool. They give a casual look, suitable for all weather conditions and seasons. With a comfort range of 40°F to 95°F, you expect nothing less but superior performance and solid construction. Despite their rugged look and feel, they are also lightweight. This makes them ideal for long distance hiking, with minimal fatigue. You don’t feel as if you are dragging the whole city under you feet. Cushion EVA midsole provides underfoot cushioning and shock absorption. Their new EVA outsole features rubber pods that provide optimal support and traction. You will not end up with wet feet during your winter hiking anymore, since these are 100% waterproof, flexible and lightweight. Extended rubber coverage offers extra protection. This ensures they don’t age prematurely while protecting your feet against abrasion. This rubber vulcanization binds all the rubber pieces together forming a highly lightweight and extremely durable shell. The stretch and sturdiness of CR-foam bootie provides easy slip on and off, without having to pull on the shoe. Once your hike is over, of course your boots will be very dirty. However, that should not be anything to worry you, since these are easy to clean up. Apart from being durable, the nylon upper and the rubber shell can be easily cleaned using a water spray or just scrubbing them gently with some water and soap. In terms of sizing, they only available in whole sizes only. Therefore, if you happen to have a shoe size with a half digit on top, order the next full size. If you are looking for one of the best insulated hiking boots for winter and cold weather, then the KEEN Men’s Revel III Hiking Boot should be your ideal choice. With these ones, no amount of rain or snow will prevent you from your adventures. Keen are popularly known for their casual footwear and sandals. However, they went a step further to create a reliable hiking boot. What sets these apart from the other winter boots on the market is the generous padding and insulation. Forget those knockoffs which promise to be waterproof, only to leave your feet soaking wet on just a few inches of snow. These ones are real hiking boots with that traditional no-nonsense backpacking appearance. Unlike other insulated winter boots that tend to be very bulky and clunky, these ones are lightweight. They are true to size and you can also get half sizes. Featuring Nubuck leather combined with KEEN.DRY lining, they are both breathable and waterproof. Their sole is made from tough rubber, which is able to handle all manner of terrains. They also come with inbuilt gaiter ring hooks which allow you to attach gaiters to keep snow out and protect your lower leg. The inside is breathable, comfortable and well-insulated. Their footbed, which is a dual-layer thermal heat shield, contains both a thermal foil interior and a soft outside. The footbed is therefore able to trap internal heat while improving its insulating abilities. These winter hiking boots use two main forms of insulation which are the Heat Trapolator and the KEEN.WARM. The Heat Trapolator contains 3 layers of insulation for trapping heat and warmth while the KEEN.WARM is responsible for lightweight insulation. When it comes to traction, the KEEN Revel III works great in snow, dirt or mud. If you will be expecting heavy snow, then you can attach crampons. The KEEN Men’s Durand Polar hiking boots are tough for those rugged winter trails, and stylish enough as you take a stroll in town during winter. With a solid attention to detail and extremely high levels of quality, these are comfortable boots with all the intentions to keep you dry and warm in the snowy and cold mountains. They are both smart and rugged. They can handle extended hiking trips and you will not look out of place when you meet up with friends at your local for a few drinks. Their versatility is what endears them to most people. Have you realized that most snow boots can handle the great outdoors really well but appear too much when you wear them elsewhere? This is what sets these ones apart from other snow hiking boots. They are able to strike the perfect balance. With 400 grams of Keen insulation, you don’t expect anything less than absolute warmth and comfort. Excess moisture can cause blisters, discomfort and even frostbites in extreme cold conditions. However, with these ones, you will never experience even a drop of moisture. Being 100% waterproof means that you can wear them during heavy rain or snow, and your feet will remain warm and dry. This is made possible by the KEEN.DRY waterproof and breathable membrane. You might be thinking that with all these protective features, comfort was not a priority when creating these boots. However, your assumption is wrong. The use of the 7 riveted lace-up technique wraps around your ankles nicely while providing some level of support. Additional comfort is provided by integrated polyurethane midsoles and heel cushions that keep your feet comfortable during those extended days on the trail. The Removable, dual-density footbeds provide additional cushioning and support while the thermoplastic urethane shanks offer good underground stability, when hiking on uneven terrains. Dual-compound, grippy rubber outsoles give you all the freedom you need to hike through snow and ice, like a boss! If you are looking for mid-height winter hiking boots that you can use on and off the trail, then the Salomon Kaipo CS is a great choice. As much as these boots are designed for hikers, they feature a sleek design, which means you can use them to run errands in the city during winter. Salomon is renowned for making boots that are of superior quality, comfortable and durable. The Kaipa CS is no different. These winter hiking boots for men feature waterproof synthetic and leather uppers, which shed snow, rain and other forms of perspiration that you might encounter. They are further fitted with internal booties, featuring Climashield waterproof membranes for additional protection against slushy and snowy conditions. Their tongues are gusseted to keep moisture out while keeping your feet dry. Also, these boots are insulated with up to four layers of synthetic insulation. As much as the four layers of insulation supply adequate warmth to your feet, it doesn’t add any noticeable weight. On the other hand, the molded EVA midsoles supply lightweight cushioning as well as stability. On top of that, the EVA footbeds minimize underfoot impact while providing step-in cushioning. They come with outsoles made of a durable rubber compound, which supplies grip and traction while providing additional protection and cushioning. Harsh winter weather should no longer be an excuse to remain indoors. As long as you have the Salomon Men’s Kaïpo CS Waterproof 2, you can hike, climb mountains and enjoy the great outdoors as much as you want. Euro hikers have been customer favorite for many years. Their quality has only changed for the better, that’s why they have managed to remain popular, among hikers and outdoor enthusiasts. There are many reasons why men love these boots. Created for high performance, they will provide comfort wherever you go. Featuring premium full grain leather on the upper and rubber outsoles, these one are designed to retain durability and long term use. Padded collars provide comfortable fit round the ankles, without inhibiting movement. Lateral stability and support is provided by the steel shanks. The EVA midsoles offer shock absorption and lightweight cushioning. These are environmentally friendly shoes featuring 100% PET mesh lining and 42% recycled rubber. When it comes to waterproofing, the company uses waterproof impregnated properties which form part of the leather throughout the tanning process. The boots are then seam sealed or internally waterproofed using a breathable membrane. This makes Timberlands among the best winter hiking boots. These ones are very stylish, with a very unique lacing system. They can be worn throughout the year, and they will still remain reliable and protective. When it comes to size, they tend to run small, especially for men with wide feet. Therefore, order a half size larger. Still on that, if you intend to be wearing them with thick socks quite often, then you should also order a slightly larger one. This is some older content I have written a few years ago. I didn’t want to hold it back from you, my dear Boot Bomb reader! Why Hikings Boots For Winter? Let’s say that you want to go hiking in the winter and you expect to encounter lots of snow. In that case, you will need winter hiking boots. These kinds of boots have some extra layers and are therefore more suitable for hiking in the snow. Naturally, you will want to buy the most you can get for your money. So make sure to have a look at different kinds of brands. Once you’ve decided which brand you want, check out the materials they use in their boots. The price of winter boots for trekking will vary wildly. It might be best to simply expect to pay the maximum price and select by quality rather than cost. If you expect to go hiking frequently, then you will need a very durable boot. Durable costs more, naturally. But if you just want to try out hiking once or twice, you might as well go with a cheaper boot. But lower priced winter boots are not always lower in quality. Some brands are simply charging you for the brand, while they aren’t even using superior materials. Naturally, people tend to value things more when there is a certain price tag attached to it. But rest assured that some lower priced winter boots are also very high quality. Trekking boots for the cold season come in all sorts of prices, ranging from far below $100, all the way up to $200, which buys you the hi-tech stuff. Check out the Lowa Echo GTX for example. That’s a good example of a high end boot right there. The GTX boot is one of the most pricey boots that money can buy. If you are planning on doing lots of hiking all throughout the year, then a GTX winter boot is easily going to be worth the investment. Many people I know love to go hiking on the weekends. The GTX is great for frequent trips such as this one. This is especially true if you go hiking in snowy mountain areas. Mountain areas always have a higher chance of snow. Next to a good pair of boots for treading through the snow, you will also require a whole bunch of other gear for your trip into the wilderness. Many people wear their hiking shoes to their destination and do not bother to pack an extra pair. But sometimes, an extra pair can go a long way. You will be traveling rough terrain and rocky paths. No matter how good your shoes are, they might break. A sole might come off. It’s happened before. In that case, you’ll be glad you have brought a spare pair. Especially if you’re hiking in the middle of the winter. Waterproof trekking shoes can really help you out when you are traversing wet areas. Nothing is more annoying than having to hike using a pair of shoes that doesn’t really fit snugly or is otherwise uncomfortable. Let’s say you’re a guy or gal that enjoys being active outdoors. You’re going to have to get yourself a good pair of trekking boots, especially if you intend to go into snowy areas. It does not really matter whether you go for boots that are marketed as ‘hiking’ or as ‘backpacking’ (or even as ‘trekking’ for that matter), because they are all pretty much the same. All these types of boots have been designed especially for supporting you in your outdoor activities. When shopping for boots, you will have to make sure to get the right size. Not only does the length of the boot matter, but so does the width. Women tend to have more narrow feet than men. And this is the most important difference between men’s and women’s winter boots. When you are an enthusiastic hiker, you are going to be standing up straight for most of the day, and you will need pretty good support for you and your tootsies. Make sure to go for waterproof boots if you don’t want to end up with wet feet. There are going to be more than one puddles along your way, especially in areas that are covered in snow. If your feet get wet, you will run a greater risk of developing blisters because it increases the friction. And nobody wants a bad case of the blisters. The added extra benefit of waterproof boots, is that they are more durable and they will last even longer than a regular boot which is not water proof. Also make sure that you get a good pair of socks for your boots (and feet ofcourse). Socks are available in different thickness. If you get socks that are too thin, they will leave too much room. If you get socks that are too thick, they will leave to little room. The sock that you are going to use, will have to be a really great fit for your feet as well as your boots. If your socks are too thick, you’re going to have a bad time. There will be too much pressure and your foot health will suffer because of it. Bulky socks are going to wrinkle. This will also lead to discomfort and blisters. Be sure to try out your hiking boots before you go out and take a hike. You do not want to discover that your socks are no good when you arrive at your hiking trail. How To Pick The Right Winter Boots? At the time of writing, winter is almost upon us. It is about time that we start thinking about buying some warm winter clothes. For some people, shopping can be a real chore, rather than a fun experience (which is what it is supposed to be). So I’m sure you’ll gladly take any advice I can give you to make it easier on you. Winter requires more clothes, because it takes more clothing items to keep you warm. For that reason, winter shopping is much more difficult than summer shopping. I’m going to confess that I am a difficult person when it comes to shopping. I am always having trouble picking the right things for myself. Usually I like to have someone with me to give me a second opinion. In the past, I’ve taken along people that did not have enough patience. So that was kind of a nuisance. But they were still of great help. Selecting the right kind of shoes has got to be the hardest thing there is, for me personally. In winter, you will need some warm boots to keep yourself from freezing over. Especially if you intend to walk around in big layers of snow. I myself did not grow up in a very cold climate. For that reason, I was never very well informed on which boots to buy for cold temperatures. I have learned a lot throughout the years. So I wrote this post in order to inform other people and help them make the right choice. It seems like a nice thing to do. When selecting the right kind of men’s or women’s winter boot for yourself, please put practicality first and fashion second. Remind yourself of what you need those boots for. If you’re going to go on a hike this winter, then you probably already know where I’m going with this. The same goes for when you are planning on skiing or snow boarding. On the other hand, you may just need a couple of warm, comfortable boots so you can hit the town. But since you are reading this page, I’m going to go out on a limb and assume you want to go hiking. In that case, fashion is going to come second. You are going to need hiking boots that are extremely tough and durable. You might even opt to go for boots that have spikes. If you don’t have spikes, you might not have enough grip. That means you’re going to slip, fall, and (god forbid) break something! You would do best to invest in a good pair of boots that are going to last you for a decade. While a good pair of trekking boots for winter will bring along a hefty up front investment, they will certainly pay back for themselves in due time. However, if you need boots that will simply keep you warm while you are walking around outside where you live, you’ve got some more leeway. For starters, you will not have to shell out as big time as you should with hiking boots. However, for winter it is always a good idea to go waterproof. Another good idea, is to go for boots that have soles with good grip. Because even when you are not climbing icy mountains, you can still slip on a smooth curbwalk. Not a winter goes by that I do not see somebody slip in the icy city streets, simply because their shoe soles aren’t gripping the pavement enough. Most of the time, a good slip will not give a person a big injury. But the older you get, the more risk you have. Also consider what kinds of winter clothes you will be wanting to wear with your boots. Are you going to need clothes for just getting around the town on the weekends? Or do you need clothes that will keep you warm indoors because you want to save on radiator costs? Whichever winter clothes you go for, winterboots will mostly come in brown or black. That means you can wear them with pretty much anything. So that makes life easier right there. Despite the fact that fashion comes second, you will still want to keep the matching of colors in mind. You can look ridiculous in a clashing color combination when it comes to your winter wardrobe. I hope the above tips have helped you in making a decision as to which winter boots you will want to buy for your next hike. Just remember to first consider the practicality and the fashion second. Just so long as you stick to that advice, I think you’re going to do just fine. I hope you have enjoyed my ultimate winter hiking boot buying guide for 2019. Lord knows it took me long enough to compile it. I’m exhausted! It was all totally worth it, though. I plan on thru-hiking the PCT this year. If you’re going to a snowy place yourself as well, you would probably do well to purchase one of these boots! Got a question about any of these boots? Want to compliment me because I wrote something you like? Want to cuss at me because I wrote something you didn’t like? By all means… send me an email! Are you looking for non winter hiking boots? Go check out my men’s hiking boots and women’s hiking boots pages. They are just as awesome as this page is, I assure you! 3.1 Why Hikings Boots For Winter? 3.2 How To Pick The Right Winter Boots?